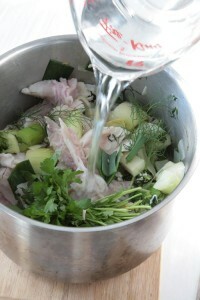 If you enjoy seafood, you’ll love what homemade fish stock does to chowders, sauces and stews. Fish stock can be made with any type of white fish, but halibut is in season and it creates the most delicate, flavourful broth imaginable. Vegetables, herbs, wine, water and halibut bones create a milky stock that outshines anything in a box, can or cube. Unlike beef or chicken stock, fish stock only needs to simmer for about 30 minutes. Most fish stores, or seafood departments, are happy to save their halibut bones for you. If you ask nicely, they might even chop them into manageable sized pieces, which you’ll appreciate because some halibut are enormous. Call ahead to find out when the next halibut shipment arrives. continue to cook until the wine has evaporated by about half. to just cover the ingredients. for 30 minutes. The stock should not boil. or refrigerate for up to three days. to plastic freezer bags and kept frozen for up to four months. I don’t like cream in my coffee but I love coffee in my ice cream. Whether or not you enjoy a cuppa, this ice cream transcends coffee by taming its bitter edge. 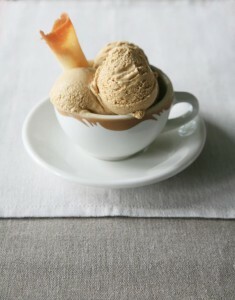 Start with a basic ice cream recipe and then add a potent coffee syrup. I’ve tried a rich concentrate of freshly ground expresso beans but my best results have come from less exotic means: instant coffee crystals mixed with a bit of water. If you enjoy chocolate with your coffee, feel free to toss a handful of roughly chopped semi-sweet chocolate to the chilled custard. Moisten the coffee with 1 tablespoon of hot water, adding more water as necessary to create a syrup consistency. Strain and cool the mixture. Prepare and chill the ice cream custard as directed in the homemade ice cream recipe. Add the coffee concentrate to the the chilled custard, a teaspoon at at time until you are satisfied with the taste. 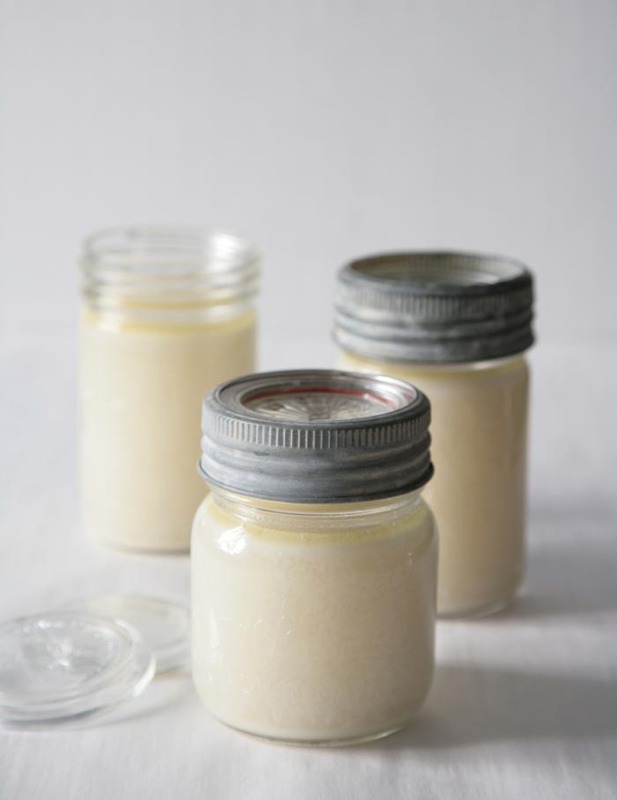 Pour the mixture into a frozen canister of an ice cream maker and follow the manufacturer’s instructions. Spot prawn season is so brief, it hardly seems fair. If you’re lucky enough to live in the Pacific Northwest, you owe it to yourself to indulge as often as possible during the prawns’ fleeting season, from May to June. 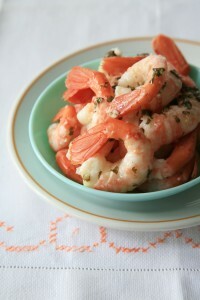 Spot prawns are so sweet and succulent they need little fussing. Some purists eat them raw, sashimi style, fresh off the boat. If you’re like me, you’ll enjoy them cooked, ever so briefly, with a pat of compound (flavoured) butter. If you don’t have compound butter on hand, regular butter and a few drops of freshly squeezed lemon juice will do nicely. Just promise me you won’t smother your delicate prawns in cocktail sauce. That’s no way to treat a gift from the sea. In a medium-sized bowl, combine the butter with the herbs, lemon juice, garlic and peppers. Mix until well blended. Taste and adjust seasoning, adding more lemon, salt and pepper if desired. Melt 1 – 2 Tbsp compound butter in a large nonstick skillet over medium-high heat. Working in batches (so as not to crowd the pan), sauté the shrimp in butter for about two minutes or until the shrimp are just opaque in the center. Transfer the shrimp and any buttery juices to a plate. Repeat with the remaining shrimp. Don’t hesitate to melt additional herb butter to drizzle over the cooked shrimp. Leftover herb butter can be wrapped in plastic, rolled up sausage style, and stored in the freezer. When it’s time for the next prawn feast, simply slice a few disks of herb butter and use as needed. Every chef has a stash of flavour enhancers and compound butter is one of the finest. Combine room-temperature butter with herbs, spices and a squeeze of lemon juice or vinegar for a butter that enriches everything it touches. The butter can be used right away or rolled in plastic-wrap and stored in the refrigerator — or freezer — until you need it. 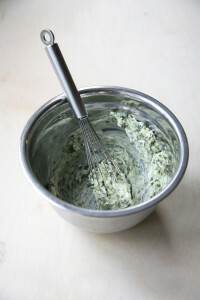 At culinary school, we made a tame version with parsley and lemon juice, but you can add just about anything to butter. I like it with jalapeno peppers and lime or anchovies and olives. There are no rules when it comes to compound butter, so feel free to tinker with your favourite seasonings. Once you have it on hand, you’ll be looking for excuses to use it. Try it in soups, sauces, corn, seafood, beans, omelettes, steak, chicken, cornbread, mashed potatoes, quinoa, rice, risotto, sandwiches, roasted vegetables, pasta, polenta … butter has no bounds. In the bowl of a food processor combine all the ingredients except the butter. When the mixture resembles a fine purée, add the softened butter. Alternatively, chop the herbs, garlic and peppers finely; add the sugar, salt, lemon juice and softened butter. Check the seasoning, adding more peppers, salt and lemon as desired. It should have a spicy kick and a tart finish. 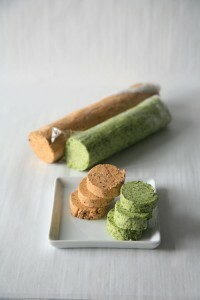 Spoon the mixture onto a piece of parchment, wax paper or plastic wrap and roll into a cylinder. Place in the fridge or freezer until ready to use. Combine ingredients in the bowl of food processor and mix until well combined. Alternatively, chop the olives, anchovies and capers finely; add the paprika, hot sauce, sugar, lemon juice and softened butter. Check the seasoning, adding more hot sauce, salt and lemon as desired. It should be piquant with a smoky finish. 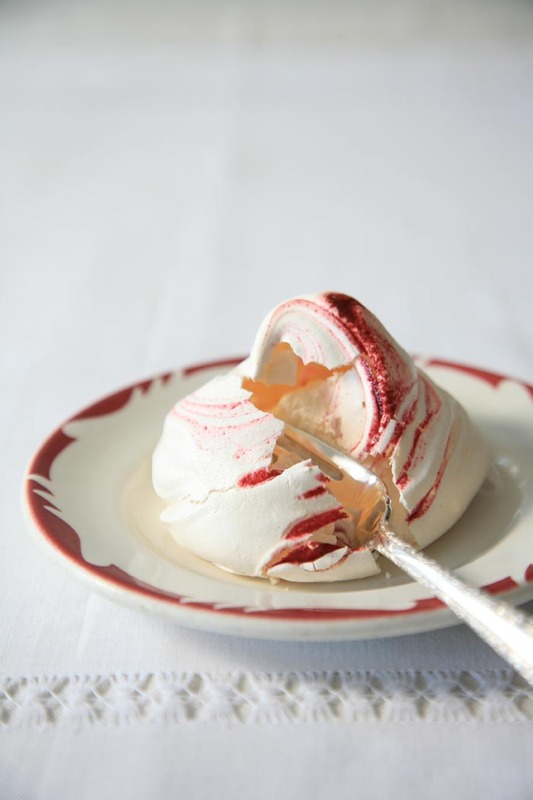 I learned to make meringue at culinary school and soon forgot all about them – until a home exchange in Bordeaux and Paris a summer ago. Everywhere I looked, meringue were piled high in bakery windows as if they were something special. My twin daughters begged me to buy them. Sometimes it takes a child, or two, to point out the obvious. Originally published in EAT Magazine Nov/Dec 2011 issue. Your mixing bowl and whisk must be scrupulously clean — the egg whites will not increase in volume if inadvertently mixed with traces of fat (like egg yolk). Using a standup or handheld mixer, beat the egg whites at medium-high speed until the volume has tripled. Slowly add the sugar in small batches, continuing to whip as you do so. Increase the speed to high and whip until you have glossy, stiff peaks. Reduce the speed to low, add the cornstarch and vinegar and whisk until incorporated. 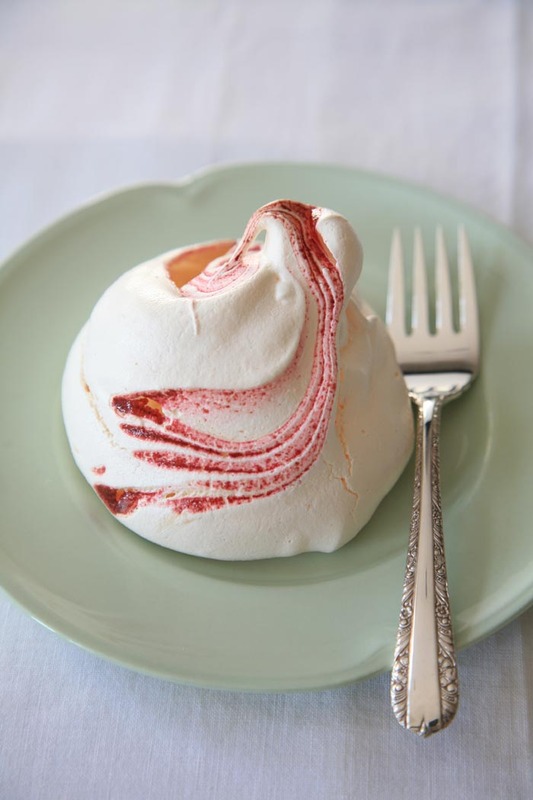 The meringue can be gently spooned into 3” – 4″ portions onto a parchment-lined baking tray or spooned into a pastry bag and piped onto a lined tray. A piping bag, available at cookware stores, will give you a more professional result. (I use a piping tip with a ¾” opening.) Dip a small knife into a bit of jam and gently drag the jam around the unbaked meringues to create a marbled effect. Bake for about an hour until the meringues are dry. Turn off the oven and leave the meringues in the oven until they cool. The meringues will crack slightly. Cooled meringue can be stored in an airtight container in a cool dry place for a few days. Note – at Christmas, I use puréed cranberries instead of jam.